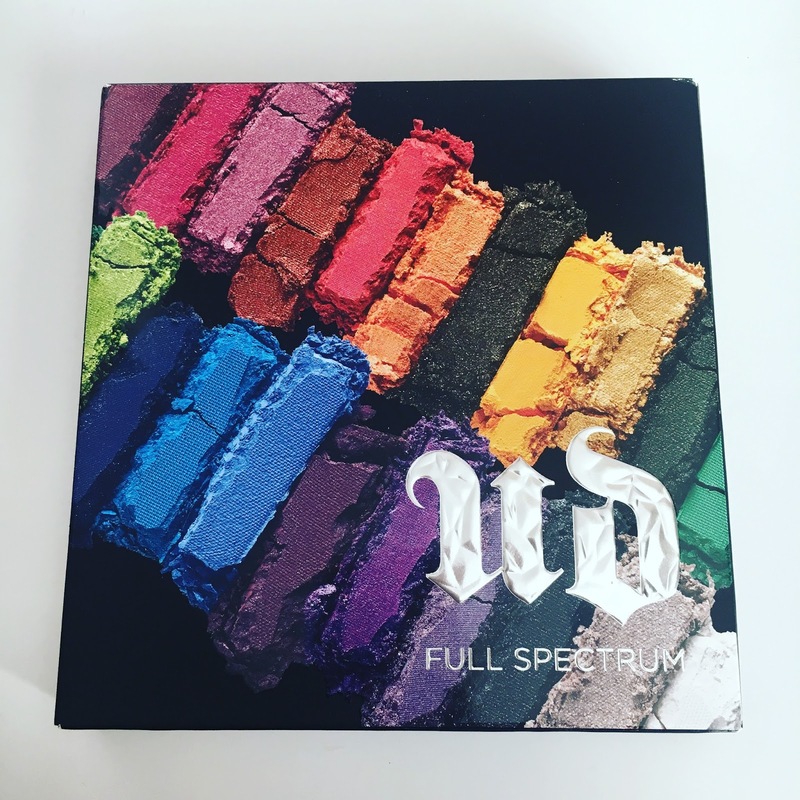 This palette seems to be in line with their previous Urban Spectrum palette and 15th Anniversary palette - the narrow pans, the plastic palette casing, and the rainbow of colors - except that this time, there are 21 shadows (which makes it more similar to the previous Vice palettes and Book of Shadows palettes, which each had 20) and this time, there really is a rainbow (like, with a yellow and everything! ), as opposed to a range of jewel-toned purples, blues, and greens. 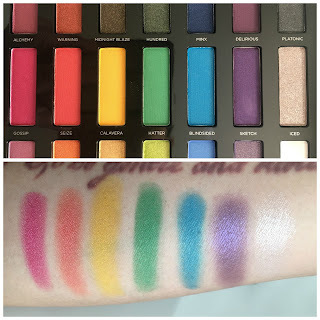 What is also really cool is that, not only do you have a rainbow, but you also have a nice gradient of smoky/blackened shades, vivid brights, and lighter/pastel-ish shades, so your rainbow can take on some different tonalities as well. The swatches below were done on bare skin with my fingers. The top row is the smoky rainbow - everything is a little darker. 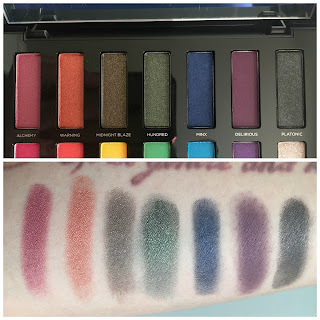 Each shade had a metallic shimmer, except for Delirious, which looked straight-up matte to me. Every shade swatched well except for Midnight Blaze and Delirious, which required a lot more building-up. Row 2 - OH GOD, Row 2! Row 2 is the row that dreams are made of. Bright with a touch of sparkle and shimmer. This is also the first time ever (that I can remember) seeing that kind of a yellow in an Urban Decay palette. Sketch came out a little disappointing - for one thing, just metallic instead of metallic-shimmer, which would be fine except that it too needed a lot of building-up. So far, the two purples in this palette are not up to par 😐. Ice doesn't have much pigment, but I'm not sure if it's supposed to or not? It looks like a topper shade to me - something you pat on top of another color to add sparkle without changing the color. 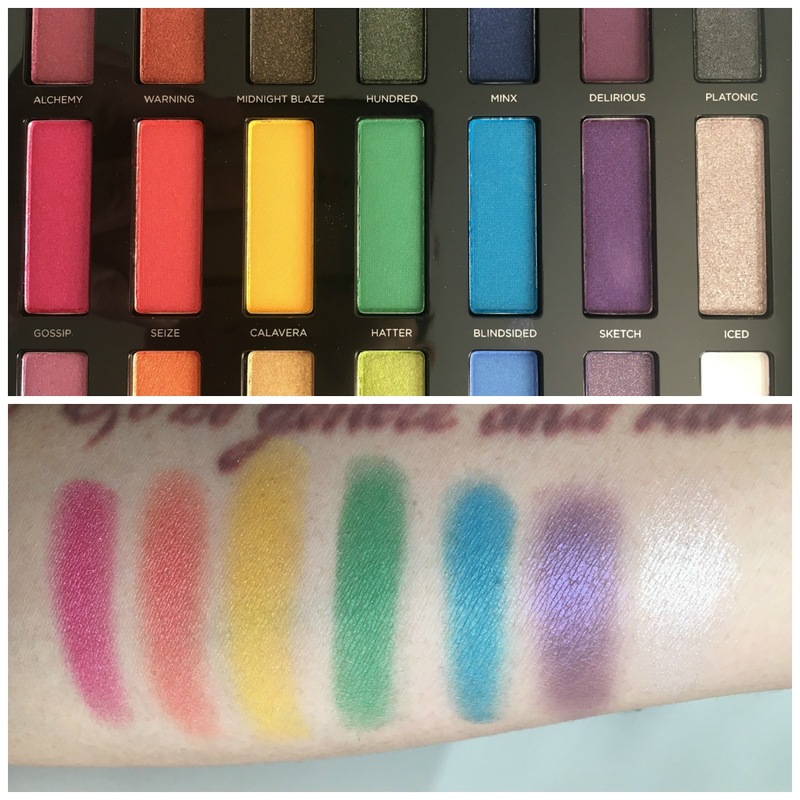 It reminds me of UD's Moondust shadows a bit. Row 2 is EVERYTHING. This row is pretty much worth the price of admission. The bottom row is lighter/pastel colors - gentle and shimmery! 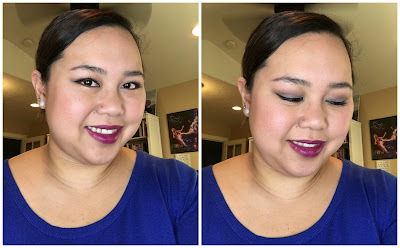 Metamorphosis gave me a little trouble (but then again, the one that came in my Alice Through the Looking Glass palette did too), and Bump was a little chalky, but then again, it IS a pure matte white. Faded was NOT disappointing - in fact, it's absolutely gorgeous! It's a darkened lavender with GOLD microsparkle. Overall, a solid palette. 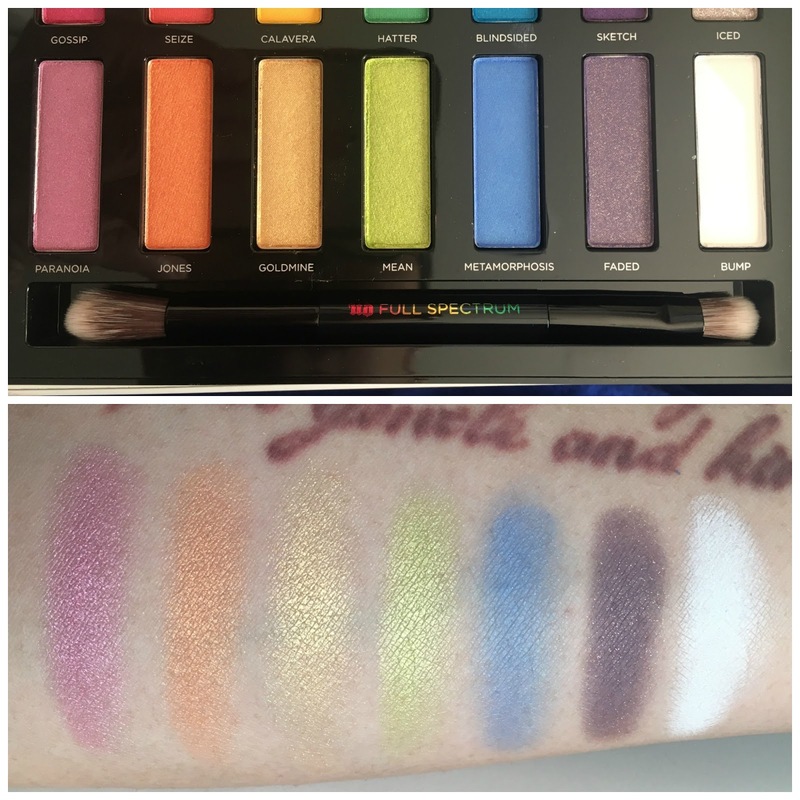 Not UD's best in terms of quality, but faaaaaar from being their worst, and if you haven't had a chance to pick up any other colorful palettes lately (*cough* Mi Vida Loca Remixed *cough*), then this is certainly worth your time, especially if you've got a nice coupon code to use. 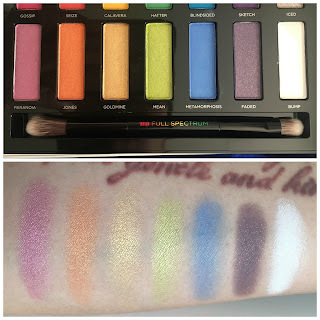 Be forewarned that this is the type of palette that you will need to supplement with some neutrals, since there is nary a flesh tone in sight. 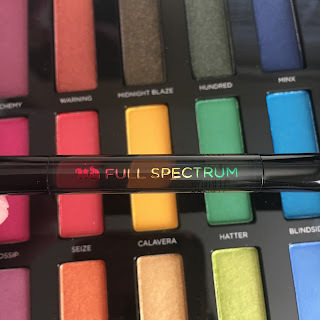 But yeah, aside from a couple shades that need more effort, this would be a solid addition to anyone's collection, especially if you're looking to expand your makeup horizons. Bonus: I haven't done one in a while, so here's a FOTD for you, using this palette!